"Habey USA introduces the MITX-6500. 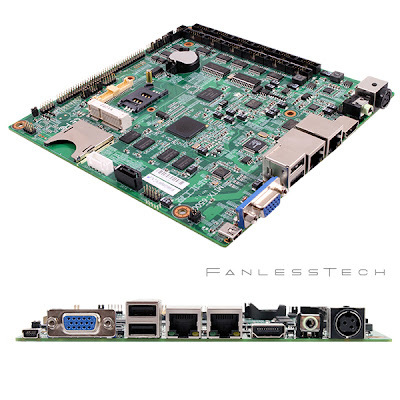 This mini-ITX small form factor board uses the Freescale i.MX53 processor which is a power efficient implementation of the ARM Cortex™ A8 core that offers long lifecycle support. This processor features full HD 1080p playback as well as 1080p decoding and 720p encoding using hardware acceleration and the ability of running dual independent displays through the HDMI, VGA or LVDS interfaces. This board is designed to operate on Android or Linux Qt natively. The mini-ITX platform allows it to be space saving, having a small foot print, but at the same time have enough real estate for some serious I/O. The MITX-6500 is built to industrial standards so you can run it in a factory, but it's cost effective enough to run as a media streamer in your living room." This looks sweet and could be a substitute for Kontron's Tegra 3 motherboard (still listed as "coming soon"), but since it's an industrial grade product it certainly won't come cheap.